Successfully Added Pet Dog Training Collar with LCD Display Remote to your Shopping Cart. Does your dog exhibit any of the following bad behavior? Excessive barking, biting and other "rough playfulness", destruction of clothes, furniture, and other property or toileting wherever they feel. Then you should look into purchasing this excellent and effective dog training collar. This collar is an excellent and exceptionally effective device to control your dog's negative behavior. For example, if your dog barks excessively, then this handy gadget is the perfect tool to get them to stop because the remote control allows you to apply a vibration or mild shock to the collar in order to curb their enthusiasm. The shock is not enough to hurt your dog, but just enough to get them to change their behavior. Don’t think of it as a painful electric shock, it’s more like a signal to your dog to act properly. With remote control in hand, you can generate a vibration, or a mild shock. 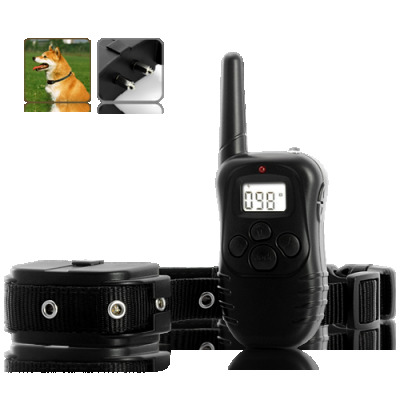 With the LCD remote, you can incrementally increase the vibrations and shocks so that you can choose the correct level to correspond with the bad behavior the dog is exhibiting. Dog shock training collars are the most often used training device for dogs that have not responded to normal discipline techniques. But they're also frequently used to train dogs for human-assisting tasks like with seeing-eye, show jumping, and security guard dogs. Another great point about this gadget is that this unit can be used for non-disciplinary communication as well. Instead of shouting for your dog to return, just press the remote to generate a vibration up to 100 meters away and they'll get the message. Other users have successfully created their own shock and vibration system to innovatively communicate with their pet! It’s important to note the device doesn’t cause any undue stress or suffering on your pet. It is a really great gadget for letting you quickly and efficiently train your pet when they don’t react or learn from verbal commands easily. Our great wholesale price makes this Pet Dog Training Collar with LCD Display Remote perfect either for the re-sale market, OEM market, or personal use. As always, it is available to ship direct to you or your customer, with a 12 month guarantee this little device is sure to be popular and profitable, from your source for high tech electronic gadgets, Chinavasion. Does your dog bark at the wrong times? Did they destroy your priceless Spiderman comic book collection? Did they soil your Alienware Laptop? SOLUTION: our Dog Training Collar! Used to train highly disciplinary canine occupations like seeing eye, exhibition, and security guard dogs. No one likes the idea of giving any kind of shock to their cute furry doggie, however the electric current produced by this device is very mild. Try it for yourself before putting it onto your dog. You will notice that the shock only provides a slight, temporary discomfort. It is a signal that your dog understands when they might not understand your voice commands. How long does the shock last? As long as you keep your finger on the remote. We find a quick tap lasting less than a second works best. 8 days to reach the uk....first class service again from chinavision.. i love this site !! An excellent way to train dogs gradually. For the price, it cannot be beat. My only beef is the transmitter does not hold 2 x4- LR44 batt. properly. I had to pull the springs to make contact possible. I hope Chinavasion corrects this problem. Other than that, it is a good deal compared to others.